Review of Upright Brewing Seven | Beer Apprentice - Craft Beer News, Reviews, Interviews and Info. Hello everyone. Thanks for checking back in on another craft beer review. 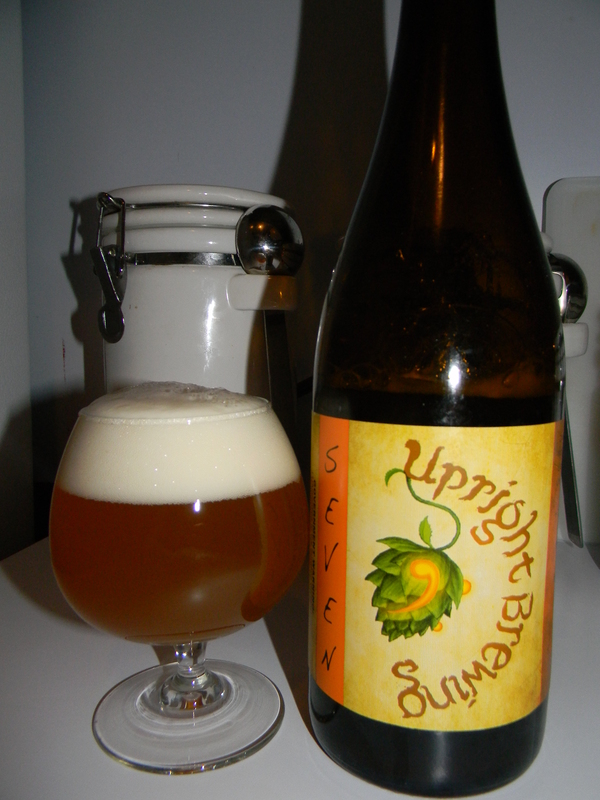 Today, I’m going to be trying the Seven produced by the Upright Brewing Company located in Portland, Oregon. This will be the last of my “numbered” Upright brew reviews. It’s been a lot of fun trying each one and I’m really excited to see how the Seven stacks up to the other three that I’ve had. From the website, uprightbrewing.com, we get this bit of information about the Seven. Seven is the most Belgian-esque of the numbered beers, where the house yeast is fully expressed with a big fruitiness while the hops provide spicy and herbal elements. The beer has some heft mid-palate but finishes dry. This beer came in a 25.4 oz. bottle and it produced an ABV of 8.0%. It poured a hazy, golden/orange color with a wonderfully sized white head. The texture was rocky, soapy, fluffy and soft. The retention time was choice and the lacing left behind was splendid. It really seemed to hang around for a great while. The nose began with a very favorable orange citrus intermingled with tones of lemongrass and peppery spice. It was quite yeasty, floral and bready smelling. A very feasible amount of funkiness was discovered as well. All in all, a very proper and well balanced bouquet. Nothing too crazy, yet boisterous enough to keep me interested for the duration. The flavor seemed to let the orange citrus protrude a bit more than it did in the aroma. The lemony characteristics were dialed back a touch, yet the grassy and bready savors remained solid. It was kind of like a sweeter tasting wheat beer in that regard. The musty funk and the pepper began on the light side, however they gradually became more pronounced and defined as the beer opened up. The mouthfeel was a sturdy medium. Dry, zesty, crisp, refreshing and snappy. The carbonation was of medium/high consistency. Just a touch of bite and warmth was felt from the spice and the alcohol. A noble amount of flavor was left coating the tongue and roof of the mouth after each sip as well. Well, I thought this to be a very, very nice beer. I really liked it. It had plenty of attributes to critic and the drinkability was quite good for a beer with an ABV of 8.0%. In fact, I made my way through this bottle rather quickly. I’d love to always have an extra bottle of this sitting around for the Summer that’s for sure. I’d recommend it without any hesitation. So, if you guys can get the Upright Brewing Seven in your area… pick it up and give it a test drive and see what you think. I’d be willing to bet that if you like the Belgian Saison/Farmhouse style that you’d like this one. Posted by Beer Apprentice on May 7, 2013 in Country: USA, Upright Brewing Co.